In this installment: 4-seed Louisville (28-9) vs. 1-seed Michigan State (29-7). I will admit to not knowing much about Louisville, Kentucky, besides the fact that they have a baseball bat factory (and I’m not even sure that’s true). But this place called it the eighth-best college town in America, and that’s got to count for something, right? Also counting for something: Louisville is going up against East Lansing, Michigan. Decent town, good party school, but not a typical inclusion on your average top 10 list. What a doozy! Let’s look at the unfiltered college stats before we get into personalities and all that. Tom Izzo: One team, 412-168 record (.710), seven Big Ten regular-season titles, three Big Ten tournament titles, six Final Four appearances, one national championship. Rick Pitino: Five teams, 612-227 record (.729), six regular-season titles, 10 conference tournament titles, five Final Four appearances, one national championship. Whoa. What do you possibly say to that? I guess — GUESS — the slight edge might go to Pitino for total wins and a better percentage. And let’s be honest, Tubby Smith’s 1998 title pretty much belongs to Pitino, too. 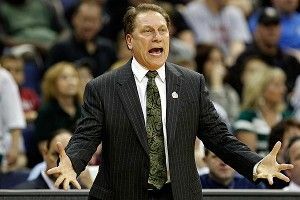 But, man, it’s close, and Tom Izzo is way more likeable, right? I almost want to give it to the Izz just because I wish he were my grandpa. You could even justify it by saying that he’s squeezed more success into fewer years, which, now that I think about it, is a pretty solid argument. As for Pitino, a former middle school coach of mine tells this story: He was working as a dishwasher in New York City when Pitino came into his restaurant with a group of pals. This was in the late ’80s, when he was with the Knicks and had taken Providence to the Final Four a couple years before. He was a hero to my coach, so later in the night, he gathered his courage, went to the table, and told Pitino how much he admired and respected him. Pitino looked up and asked where he was from. “Saranac Lake, New York,” my coach said. Pitino’s response was immediate: “Never heard of it.” And he went back to talking with his friends and didn’t say another word as my coach slouched off back to the kitchen. Now tell me, college basketball fans, after a lifetime of watching Rick Pitino in action, is this story at all hard to believe? I can’t do it. I can’t give it to Pitino. Gee, I don’t know, the most badass militaristic culture in world history against a bird. The best player on the floor, of course, is Michigan State senior Draymond Green, the Big Ten Player of the Year and the first man to notch multiple NCAA tournament triple-doubles since Magic Johnson. He’s the bulldozing, deceptively graceful force behind the Spartans’ success, averaging a double-double (16.3 points, 10.5 boards), and they’ll go as far as he takes them. He’s joined by Keith Appling, the dynamic sophomore point guard who averages 11.5 points and four assists and was named third-team All-Big Ten. After them, Michigan State relies on 6-foot-9 Derrick Nix for eight points a game and four rebounds. Austin Thornton and Brandon Wood are 3-point threats, and Adreian Payne contributes seven points and four boards. Louisville has what can be considered one of the most balanced scoring attacks in the country, with six players averaging at least nine points per game, and nobody averaging more than 13. The Big East tournament champions didn’t put a single player on the first, second, or third All-Big East teams, a tribute both to their balance and their lack of spectacular talent. Peyton Siva is the most recognizable name, but he’s actually fifth on the scoring list at 9.2 points. The Cardinals are led by Kyle Kuric, the 6-foot-4 senior who shoots a lot of 3-pointers (but only makes 33 percent) and averages 13 points per game. It’s a relatively small team, with 6-foot-10 Gorgui Dieng and 6-foot-7 Chane Behanan as the only real presences on the interior (9.1 and 7.4 boards per game, respectively), and if either gets in foul trouble, the tone and pace of play change quickly. Russ Smith has struggled shooting 3s this year, but he was 3-for-3 in a critical stint off the bench in the win over New Mexico. Overall, it’s hard to make the argument that Louisville has anyone to match Green and Appling. Tom Izzo has crafted his reputation on fielding strong, grinding teams that peak in March. It’s why the Spartans are such a regular presence in the Final Four, and it’s why I like them to make it again this season from a relatively weak region. Nobody personifies Michigan State’s toughness (there it is, that unavoidable word again) like Green, and his strength will present a particular problem for Louisville’s interior, especially when they have to keep Nix off the offensive glass. Michigan State likes to play slow, and Louisville’s one chance is to harass the guards with some three-quarter pressure and try to disrupt their offense. And that outcome isn’t out of the question; the Cardinals have the second-most-efficient defense in the country, and they excel at defending both the perimeter and inside shot. But Michigan State crashes the offensive boards hard (25th highest rate in D-I), and Louisville is particularly vulnerable on their own glass, with the 255th-best defensive rebounding rate in the nation. And on Michigan State’s defensive end, points are even harder to come by. Playing in the ball-control-oriented Big Ten, the Spartans managed to establish the fourth-best 2-point defense and the seventh-best steal rate in the country, all while playing the physical brand of man-to-man that has become Izzo’s trademark in East Lansing. Interestingly enough, Louisville and Michigan State are two of only three teams left in the tournament that actually won their conference tournaments. (Ohio, out of the MAC, is the other, and it barely counts.) I wrote a piece a few weeks ago about how winning the regular-season conference championship is far more predictive of making the Final Four and slightly more predictive of winning a national championship, and that trend looks to continue this year. So both are riding hot streaks, and they’ve both been hard-won. The Spartans notched wins over Sweet 16 teams Ohio State and Wisconsin, and a brutal battle against St. Louis, the best 8/9 seed in the tournament. Louisville, meanwhile, ran a ridiculous gauntlet in the Big East tournament, beating Seton Hall, Marquette, Notre Dame, and Cincinnati before taking down New Mexico, one of the tournament’s top mid-majors, last weekend. There’s no way to differentiate. Draw. This is a no-doubter for me. Louisville has been fantastic, but it’s going to concede offensive boards against the Spartans, and I can’t see the Cardinals scoring inside. For a team that shoots a pretty poor 3-point percentage (31.3), the Cardinals still take an awful lot of them (171st in the country in 3-point-attempt frequency). When they find the inside game too physical, I have a feeling we’ll see the worst of that tendency as they try to bomb their way to a win. This won’t be a blowout, because that’s never been Michigan State’s style, but its man-to-man defense won’t allow for any Louisville player to lift his team (I can’t wait for the first aimless, careening Peyton Siva drive of the game, or the eight in the last two minutes), and a few timely 3s from the likes of Wood and Thornton, along with the strong pressure play we’ve come to expect from Green and Appling, will be more than enough to bring this one home.